A great charger for your 123A batteries. These batteries can be used for your Little Buddy air purifier, A laser rifle sight, a flashlight,digital cameras or any other item that can use a 123A or CR123A battery. Set comes with 4 LI-ion batteries, ac adapter, car adapter and charger. Worldwide usage. Auto AC power adjust from 100-240V Safe, build-in IC provides various protection, Thermal protection, Overcharge protection, Short-circuit protection, mechanical. and electrical protection against reversal polarity, and auto defective battery identification. Convenient, 12V car cigarette lighter plug for on the road charging Tenergy RCR123A can be recharged up to 1000 times. 1 RCR123A Li-ion = 1000 CR123A Primary Cells Replace the most of CR123A primary Lithium battery for a digital cameras and flashlight. Not compatible with SureFire Flashlight. Don't use these batteries with any SureFire Flashlights. 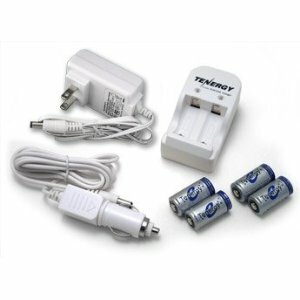 Package Includes: 4 PCs Hi-capacity 900 mAH Batteries (Rechargeable CR123A Battery, each with IC protected circuit), charger tray for two batteries, AC 120V charger, and 12V auto adapter.